Description: Andrew Young, Ambassador to the United Nations, speaks at the John F. Kennedy School of Government at Harvard University. He takes questions about the UN, divestment from South Africa, the Middle East peace process and the Carter Administration. He also discusses his transition from the civil rights movement to politics. Young has a good rapport with the students in the audience. 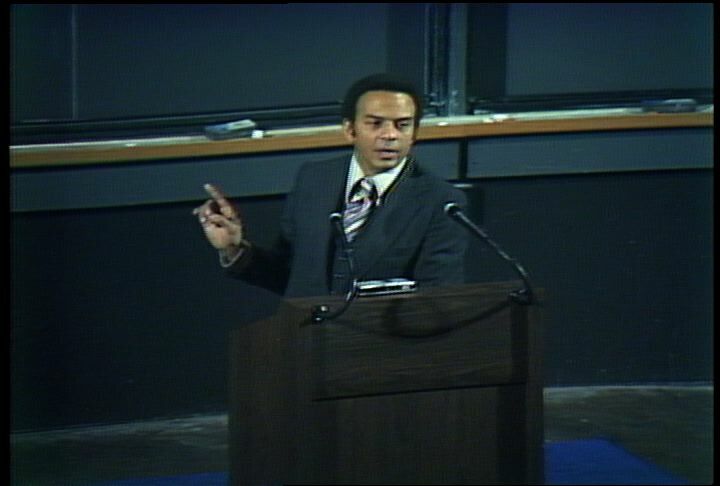 0:00:44: Visual: Andrew Young (Ambassador to the United Nations) speaks at the John F. Kennedy School of Government at Harvard University. A representative from the school sits on stage while Young speaks. Young talks about the Trilateral Commission. He says that the Trilateral Commission "is the rich people of the world getting together to talk." Young says that UN has been criticized for being a part of the "Western Bloc"; that five members of the UN Security Council are western nations; that the UN must make policy with all nations in mind. Young describes UN efforts to initiate an arms embargo against South Africa; that the UN resolution on South Africa was not as strong as many would have liked; that the resolution is effective because all of South Africa's trading partners have agreed on it. Young mentions the "North-South dialogue." He says that it is important for nations to deal with issues like trade, debt relief and foreign aid as a group; that the Trilateral Commission is a negotiating group. Young says that there are competition and adversarial relationships among members of the Trilateral Commission; that the members of the Trilateral Commission are competing with each other, not with the Third World. 0:04:12: V: Young responds to an audience member's question about the UN Security Council. Young says that the US, France and England are permanent members of the Security Council; that France and Canada hold two of the rotating seats. Young has a good rapport with the crowd. The crowd laughs at his jokes. An audience member asks about UN policy in Africa. Young says that he does not think pressure should be put on US corporations to divest from South Africa. Young adds that companies would continue to invest in South Africa through complicated transactions using foreign subsidiaries. Young notes that the students at Harvard should be learning all about the complicated finances of multi-national corporations. Young says that nothing would change through divestment; that US corporations are complicit with the government of South Africa; that change can be wrought through the guilt felt by these corporations. He notes that the students should continue to put pressure on Harvard's Board of Directors to divest from South Africa. He says that students should be idealistic, while administrators like him must be realistic. An audience member asks about the Carter Administration's policy in the Middle East. Young says that Jimmy Carter (US President) has been willing to expend political capital pushing for a peace settlement in the Middle East. Young says that Carter has never tried to impose peace on the parties involved in the conflict. Young says that Anwar Sadat (President of Egypt) has moved boldly to move the peace process forward; that the Carter Administration must work with Sadat; that the USSR must be forced to participate in the peace process; that the USSR will undermine the peace process if they are not involved. Young notes that Sadat and the Soviets have had a difficult relationship. 0:12:55: V: An audience member asks how he can remain morally conscious when the policy he conducts for the US is not always morally conscious. Young says that protest movements in the 1960s have led to a reawakening of the nation's moral conscience; that the Carter Administration was voted into office by morally conscious voters. Young notes that it is easier to protest than it is to govern; that the Carter Administration is staffed with idealistic, moral people of all races and ethnicities. Young notes that he chose to enter politics to put his ideals into action; that effective change can be made through politics as well as protest. Young talks about his experiences in the civil rights movement and the movement against the Vietnam War. Young says that there was a logical progression from the protest movements of the 1960s to the politics of change in the 1970s. Young says that he took his post in order to effect change in foreign policy; that foreign policy issues and domestic policy are closely related; that he has not compromised his ideals in performing his job. Young jokes that he tries to stand up for what is right while doing his job; that he might be looking for a new job someday because of that; that perhaps Harvard will hire him if he ever needs a job. The audience laughs at the joke. 0:18:30: V: An audience member asks Young if he has seen an increase in "television diplomacy." Young says that he has seen an increase in "television diplomacy." Young responds to another audience question. Young says that the Carter Administration is staffed with people who are advocating change; that these people were outside of politics before. Young notes that Ernie Green (Assistant Secretary for Manpower) was one of the students who integrated Little Rock High School in 1958; that Green is working hard to create jobs within the African American communities; that he has been working on the problem for only six months. Young notes that an African American lawyer from Harvard helped prepare the brief for the Bakke court case. Young notes that Patricia Harris is Carter's Secretary for Housing and Urban Development. Young says that African American organizations needs to work within the structure of the government; that the activists in the civil rights movement were working with the Kennedy Administration in the early 1960s. 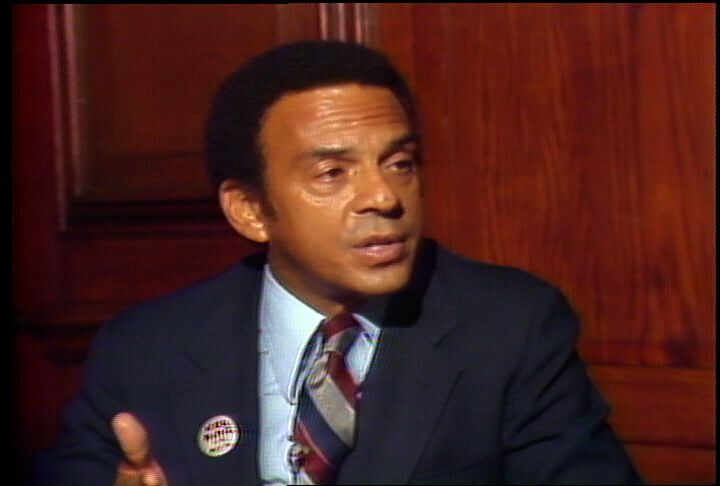 Description: Interview with Andrew Young, Mayor of Atlanta at the Parker House. Young talks about his efforts to facilitate international trade between Atlanta businesses and third-world nations. He says that urban mayors can help local businesses by leading trade delegations and encouraging local businesses to get involved in emerging markets. Young criticizes the federal government's reliance on the military in conducting foreign policy. He says that the US must act with intelligence and rely on diplomacy to solve world problems. He talks about US involvement in Vietnam, Lebanon, and El Salvador. Young and Christy George discuss African Americans in politics. Young does not believe that a candidate should not represent one single constituency. Young says that more African Americans need to be elected as senators, mayors and governors before an African American is elected as president. George reasks questions for cutaways. Young attends a cocktail party at the Parker House. Other guests include Bruce Bolling, Boston City Councilor, and Hubie Jones, Dean of the School of Social Work at Boston University. 1:00:04: Visual: Andrew Young (Mayor of Atlanta) is interviewed by Christy George in the Parker House. George asks about urban mayors taking on international roles. George notes that Mel King (candidate for mayor of Boston) is interested in Young's work in Atlanta with third-world nations; that Kevin White (Mayor of Boston) calls Boston a "world-class city." Young says that most governments help businesses; that the federal government has done little to help businesses. Young says that mayors can help local businesses. Young talks about leading trade delegations of Atlanta businessmen to other parts of the world. Young says that businessmen can gain access to government officials through the mayor. Young says that he took businesspeople, educators and a YMCA soccer team on a trip to Jamaica and Trinidad. Young says that the businesspeople did $150 million of business during a one-week trade mission. Young says that business people were allowed to see the decision-makers in foreign governments. Young says that white mayors can do the same thing. Young says that the mayors of Seattle and Indianapolis have done the same thing. Young says that there are large concentrations of Dutch and Japanese businesses in Georgia; that he is trying to build on that. George notes that African-American mayors are now dealing with third-world countries. Young says that the emerging markets are in the third world. Young says that he will visit Nigeria next week. Young says that Nigeria is buying products from Atlanta; that Nigeria is developing at a rapid rate. Young notes that Japanese and German businesses have been doing business with the third world for a long time. Young says that US businesses never needed to do business abroad until 1975. George notes that Young had been talking about doing business with the third world when he worked for Jimmy Carter (former US President). George remarks that the Democratic Party has not advocated more trade with the third world. Young says that Ronald Reagan (US President) sees everything in terms of an East-West conflict. Young says that the US needs to look beyond the East-West conflict. Young talks about US involvement in Egypt and Panama in the 1970s. Young says that diplomatic treaties can undercut communist influence. Young says that military solutions seem popular, easy and "macho." Young says that military solutions have seldom succeeded for the US or for the Soviet Union. 1:05:15: V: George asks what the Democratic Party should be doing to prepare for the 1984 elections. Young says that the Democratic Party must approach world problems with "reason and sanity." Young talks about how the US was drawn into the Vietnam War. Young says that US ships are present off the coasts of Central America and Lebanon; that the US could easily become trapped in a military situation in one of these regions. Young says that there is no military solution in Lebanon; that the US has no business there. Young says that there is no military solution in El Salvador. Young says that the US needs to show its strength through intelligence; that the US should not show its strength through destructiveness. Young says that the Democratic Party must offer clear a alternative to Reagan. Young says that the US is living on the brink of war; that this policy is insane. George asks how the Democratic Party should deal with political unrest and revolutions in the third world. Young says that the US needs to understand the impulses behind revolutions in third world country. Young says that Harry Truman (former US President) probably did not know that Ho Chi Min (former Vietnamese leader) worked as a chef at the Parker House while he was a student in Boston. Young talks about the influence of American ideas of freedom on Ho Chi Min in the 1940s. Young says that third world leaders should not be discounted as Marxists. Jump cut in videotape. George asks if African Americans need an African American candidate for president in 1984 in order to gain political influence. Young says that he disagrees; that politicians should not represent only one segment of the population. Young says that the present Democratic candidates have strong records on civil rights and minority issues. Young says that African Americans need to be involved in the campaign of a winning candidate. Young says that candidates never live up to promises made at the convention. George asks if it is time for an African American presidential candidate. Young says that there need to be more African American mayors, governors and senators before there is an African American president. George closes the interview. 1:09:57: V: The crew takes cutaway shots of George. 1:14:40: V: Footage of a cocktail reception at the Parker House. Attendees eat, drink, and socialize. Attendees include Hubie Jones (Dean of the School of Social Work, Boston University), Bruce Bolling (Boston City Council), Carol Bolling (wife of Bruce Bolling), Young, and others. Shot of Young socializing. Description: Deborah Wang reports that notes that Andrew Young (Mayor of Atlanta) was the keynote speaker at a gathering of the NAACP Legal Defense Fund gathered in Boston this evening. Wang notes that many members of the Legal Defense Fund are skeptical of President George Bush's commitment to civil rights; she adds that civil rights advocates are worried about Bush making conservative appointments to the judiciary. Wang interviews Young about Bush's presidency and his possible judicial appointments. Young says that Bush did not exhibit fairness and decency during the presidential campaign. Wang interviews Tom Franklin and Rona Kiley of the NAACP Legal Defense Fund. Franklin and Kiley say that Bush is beholden to the conservative wing of the Republican Party. Wang reports that there will be several openings in lower courts and a possible opening on the Supreme Court during Bush's term in office. Wang's report is accompanied by footage of the NAACP Legal Defense Fund gathering, by footage of Bush giving a speech and by footage of Ronald Reagan standing by as a judge is sworn in. 1:00:09: Visual: Shots of a gathering of the NAACP Legal Defense Fund. Attendees of the gathering are socializing in a large room. Footage of Tom Franklin (NAACP Legal Defense Fund) saying that his colleagues do not have a high regard for George Bush (US President-elect). Franklin says that he hopes that Bush will show more character and leadership than he has shown so far. Franklin says that he does not have high expectations for the Bush presidency. 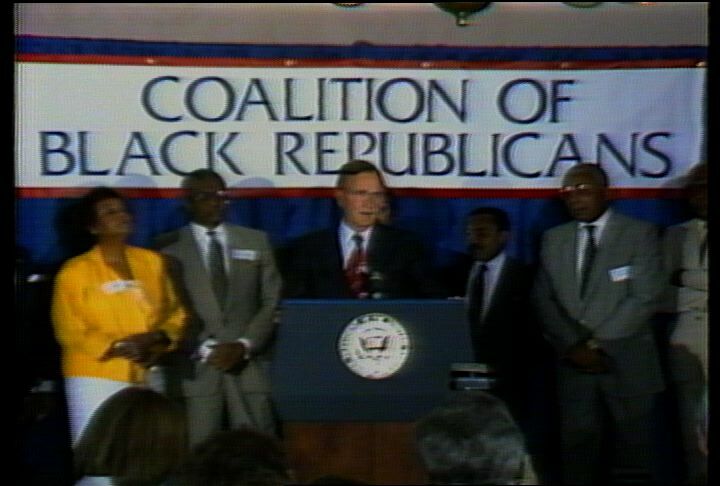 Footage of Bush addressing the Coalition of Black Republicans on August 11, 1988. Bush announces the formation of the Black Americans for Bush Committee. Wang reports that many members of the NAACP Legal Defense Fund are skeptical of Bush's commitment to civil rights. Wang notes that Andrew Young (Mayor of Atlanta) was the keynote speaker at tonight's gathering of the NAACP Legal Defense Fund. V: Footage of Young being interviewed by Wang. Young says that he wants to believe that Bush is not as bad as his campaign was. Young says that Bush could be counted on for decency and fairness in the past; that Bush did not exhibit decency and fairness during the presidential campaign. Footage of Franklin saying that Bush is beholden to the conservative wing of the Republican Party. Franklin says that Bush will talk about civil rights; that he will not take any action on civil rights issues. Wang reports that civil rights advocates are worried about Bush making conservative appointments to the judiciary. V: Shots of the exterior of the Supreme Court Building; of Reagan standing by as a federal judge is sworn in. Shot of Reagan standing behind an official at a press conference. Wang notes that there may be openings on the Supreme Court; that there will be numerous openings in lower courts. V: Footage of Young being interviewed by Wang. Young says that Bush needs to decide which wing of the Republican Party to represent. Young says that the "Eastern establishment" wing of the Republican Party has generally made wise judicial appointments. Footage of Rona Kiley (NAACP Legal Defense Fund) being interviewed by Wang. Kiley says that Bush has been playing to the conservative wing of the Republican Party. Kiley says that she hopes that Bush will not adopt Ronald Reagan's "litmus test" for making judicial appointments. Shots of the members of the NAACP Legal Defense Fund as they socialize. Description: Christopher Lydon interviews cultural historian Kiku Adatto (Harvard University) about Jesse Jackson as a presidential candidate. Lydon's interview with Adatto is accompanied by footage of Jackson throughout his political career. The footage illustrates Jackson's dynamic style of speaking. Adatto notes that Jackson is a religious figure in the political arena. She notes that Jackson's energy and moral fervor are more suited to a preacher than a politician. She says that Jackson's strength lies in his ability to articulate social criticism. Adatto says that many voters see Jackson as an outsider or a social critic instead of as a politician; she adds that some voters may not be able to envision him as president. Lydon's report also includes footage of Martin Luther King, Jr. (American civil rights leader) and Andrew Young (Mayor of Atlanta). 1:00:02: Christopher Lydon interviews Kiku Adatto (Harvard University) about Jesse Jackson (candidate for the Democratic nomination for US President). Adatto talks about the tradition of preachers in American history. She says that many of these preachers, including Martin Luther King (civil rights leader) and Jackson, have become political leaders. Visual: Shot of a black and white photo of Jackson on a balcony with King. Black and white footage of King giving a speech. Shot of a black and white photo of Jackson in a crowd, raising his arm in the black power salute. Adatto says that Jackson has tried to pick up the mantle of King; that Jackson has tried to be the "conscience of America" in the way that King was. V: Footage of Jackson addressing a crowd at Harvard University on April 4, 1985. Jackson talks about the evils of apartheid. Adatto says that there is a tradition in the US of the preacher staying outside of politics; that Jackson has tried to move into the political system in order to effect change. V: Footage of Jackson passing a lobby of a building. He shakes hands with African American bystanders. Jackson enters a room full of supporters. Adatto says that Jackson is concerned with equality and civil rights; that Jackson has been caught exhibiting prejudice against Jews; that Jackson was linked with Reverend Louis Farrakhan (African American Muslim leader). V: Shots of newspaper articles detailing the controversy surrounding Jackson's remarks about Jews in 1984. Adatto adds that the preacher must remain "morally sound" when entering the political arena. V: C-Span footage of Jackson addressing the Democratic Convention in 1984. Adatto says that Jackson has an "insider-outside dilemma"; that Jackson finds it difficult to make the compromises required by electoral politics. Adatto notes that Andrew Young (Mayor of Atlanta) made an easy transition into electoral politics. 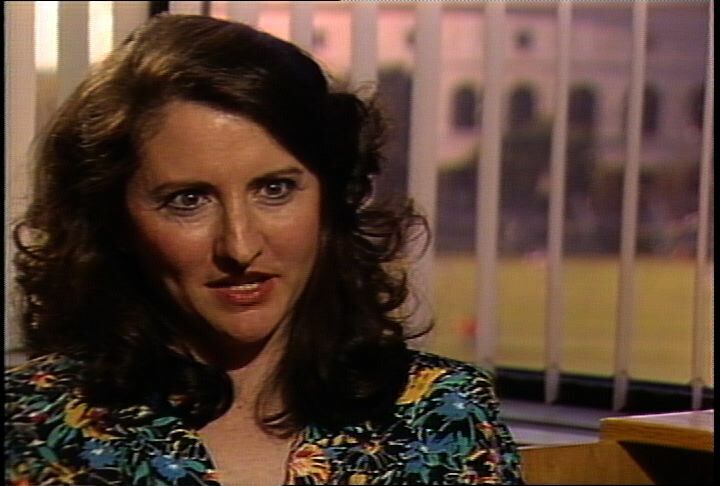 V: Shot of Young at a press conference in Boston in 1983. Adatto notes that Jackson has lost none of his energy or "moral fervor"; that Jackson still criticizes society from an outsider's point of view. Adatto adds that Young is an "insider." V: Shot of Young at a press conference. Adatto says that Jackson strength lies in his ability to articulate social criticism. V: C-Span footage of Jackson addressing the Democratic Convention in 1984. Shots of audience members. Adatto says that Jackson stirs the emotions of voters in his "outsider" role; that Jackson troubles many voters in his "insider" role. Adatto notes that Jackson's role as social reformer and critic undermines his strength as a presidential candidate; that many voters cannot envision Jackson as president. Adatto notes that many of the nation's great presidents have been calm and quietly strong; that some see Jackson as too much of a preacher; that Jackson's energy and moral fervor are more suited to preacher than politician. V: C-Span footage of Jackson addressing the Democratic Convention in 1984. Adatto says that some see voters as too much of an outsider, social critic or civil rights leader; that some white voters are turned off by Jackson. Adatto quotes statistics from a study which found that 23% of American voters are not ready to vote for any African American for president. V: C-Span footage of Jackson addressing the Democratic Convention in 1984. Adatto says that Jackson has the ability to stir the emotions of the American people; that he is most powerful in his role as "outsider" or critic. Adatto says that many voters are stirred by his message, but cannot envision him as president because he is an outsider. V: Footage of Jackson announcing his candidacy for president in 1988. His supporters stand behind him, cheering. Jackson promises "bold leadership." 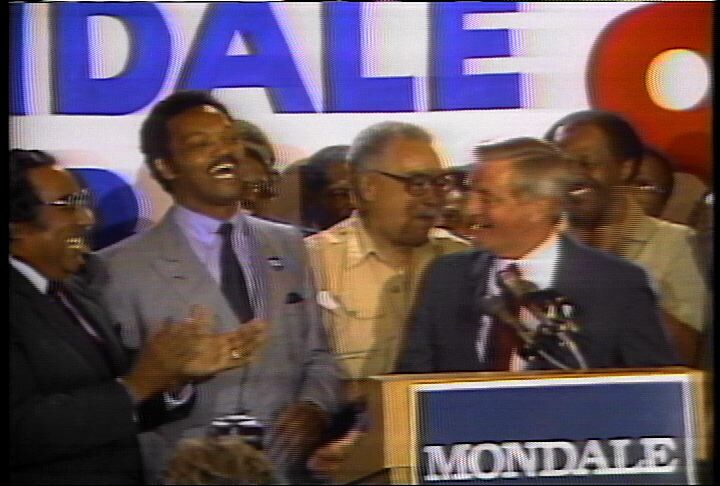 Description: Story about how Walter Mondale was able to gain the support of Jesse Jackson and the Black Caucus. Jesse Jackson speaking, audience, Mondale and Jackson talking, Andrew Young speaking in August, Jackson's endorsement of Mondale, and Young on how most "Black issues" are the same as "White issues." Some video problems. Reporter voice-over throughout. Sound. 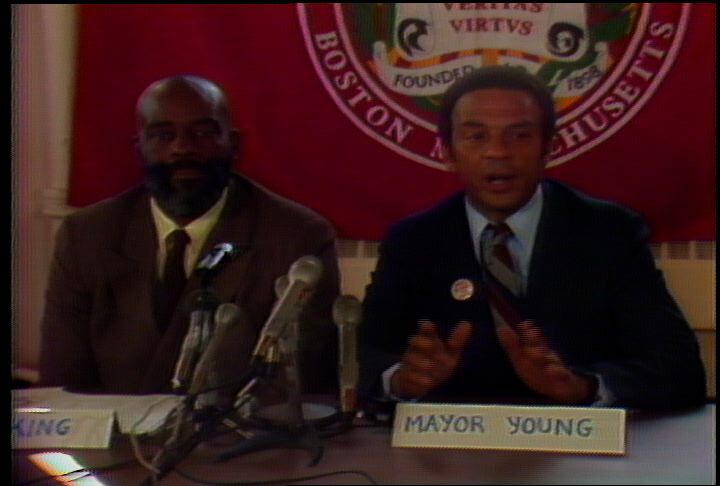 Description: Andrew Young (Mayor of Atlanta) endorses Mel King (candidate for Mayor of Boston) at a press conference at Northeastern University. Jim King (Senior Vice President, Northeastern University) introduces Young. Young talks about King's candidacy for mayor of Boston. King says that he and Young have discussed ideas for local job creation and for trade between local businesses and third world markets. In response to audience questions, Young talks about his recommendation that King set up a trade mission to export local manufactured goods. King discusses the value of his endorsement of King and the differences among the political situations in Boston, Chicago, and Philadelphia. Young says that he does not consider Boston to be a racist city. Young talks about the potential impact of the African American community on the election outcome. Young refuses to comment on the the presidential campaign of Jesse Jackson. 1:00:06: Visual: Andrew Young (Mayor of Atlanta) walks sits down at a table next to Mel King (candidate for Mayor of Boston). Mel King's campaign signs are visible on the walls of the room. Behind King and Young is a Northeastern University flag. A young African American woman announces that Young and "future mayor" Mel King will speak; that they will take questions after. Jim King (Senior Vice President, Northeastern University) introduces Young. He reviews Young's accomplishments. Shots of the audience. Young says that King's leadership will benefit Boston. Young talks about the importance of housing and neighborhood revitalization. Young says that King will work to reduce unemployment; that King will work with existing businesses and help to build new businesses. Young says that King is familiar with urban problems. Young commends King for his strong marriage, his family, and his values. 1:03:33: V: King calls Young "Mayor Class." King says that Young is one of the classiest politicians in the world; that Young has a world view which allows him make connections between his city and events in the greater world. King says that he and Young discussed how to create jobs in Boston; that Young has given him advice on how to unlock third world markets; that the city can help neighborhoods and businesses take advantages of these markets to create jobs. King thanks Young for coming to Boston. The audience applauds. 1:05:53: V: The audience asks questions. An audience member asks Young about his experiences as the Mayor of Atlanta. Young says that it is "fun" to solve local problems. Young says that he has recommended that King set up an export trading company to help export the city's manufactured goods. Young talks about trade missions that he has undertaken as Mayor of Atlanta. Young says that he has gone on trade missions to Trinidad and Jamaica, and is planning a trade mission to Nigeria. Young talks about how trade missions can benefit local businesses and industry. Young says that he and Henry Cisneros (Mayor of San Antonio) share the leadership of a task force for the National League of Cities; that mayors can create jobs by promoting international opportunities for local industry. Young says that Boston could export many products; that King is concerned about creating jobs through exports. Young says that he appointed a woman as Deputy Chief of Police in Atlanta; that her appointment heightened awareness of crimes against women in the city. Young says that it is important for a mayor to be responsive to problems of those who have been ignored; that King will be responsive. 1:09:59: V: An audience member asks Young about the value of his endorsement of King. Young says that Boston needs a good mayor; that he does not judge Boston to be a racist city on the basis of the actions of a few "hoodlums"; that there are voters who will elect King on the basis of his values and his positions on unemployment and crime; that skin color is not important. Young says that he is here as an urban mayor to remind people about important urban issues; that he is able to get television exposure for King. The audience applauds. An audience member asks Young about similarities in the political situations in Boston, Chicago and Philadelphia. Young says that there are few similarities; that there was a "revolution" against the mayor in Chicago; that there is more racial antagonism in Chicago than there is in Boston. Young says that Wilson Goode (candidate for Mayor of Philadelphia) will be elected because of his experience and broad support. Young says that he hopes King will emerge with broad support in Boston. Young refers to Boston's revolutionary history, saying that he hopes the city will rally around King. 1:14:11: V: An audience member points out that Boston has a small African American community with a record of low voter turnout. Young uses the example of Los Angeles as a city with a small minority population and a popularly elected African American mayor. An audience member asks Young to speculate on the chances of Jesse Jackson (African American political leader) being elected to the presidency. Young says that it is too soon to speculate on anyone's campaign for the presidency. 1:16:23: V: Young answers more questions from the audience. Shots of Young from behind the audience and media; of members of the audience. Audio cuts in and out during this segment. Young talks about the need for "open and honest" government and a good relationship with the press. King answers a question about his campaign. The moderator announces an end to the press conference. 1:18:45: V: Young and King greet members of the audience and the media.